Japanese style has long been admired for its grace and artistry. 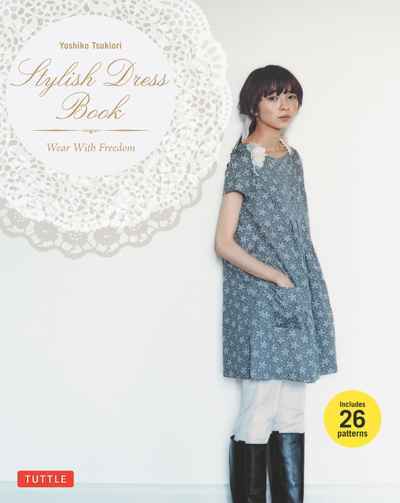 Add to that a sense of fun, and you have the sew-it-yourself Stylish Dress Book. Complete with stunning full-color photos, this Japanese sewing book (in English) gives you instructions and pull-out patterns for unique Japanese fashion — 26 relaxed and comfortable yet elegant dresses and tops — pretty, timeless pieces that can be worn year after year, by women of all ages and sizes. The detailed diagrams and easy-to-follow instructions take you step-by-step from layout to finished garment. The no-rules looks pictured in this book are perfect for today's carefree fashion sensibility and will inspire you to have fun with fabric and style.